Today, we left the LEGO WeDo kits in the closet and turned to a few new tools to help us think about two of the essential questions we are exploring in our first grade pilot robotics unit. To kick off the lesson, we read “If I Were an Engineer”, a compact, colorful rhyming book that introduces engineering to kids aged 5-8. It was my first time using the book in the classroom. The students loved guessing the end rhyme words as in… “I’d help sick people young and old- I’d even cure the common?” “COLD!” It was a great introduction to the day’s lesson. After reading the book, I reminded students that we were a group of “problem-solving engineers” and informed them that today we would be “imagining solutions” just like engineers. We reviewed… Engineers solve problems. Sometimes they create robots to solve problems. We just watched a video. The video showed us an example of a woman who had a problem and an example of how engineers designed a “robot” to help solve her problem. We are engineers. Let’s think of some problems to solve. We brainstormed and charted “Problems in the World”. Here’s a tip. Don’t be fooled by the pint-sized stature of a first grader. If you ask one a question, he or she will give you an honest answer. Just take a look at a few of the “Problems in the World” my group identified. “Yep, that’s a problem.” I said. Now that we had identified some of the world’s problems, we were ready to create some robots. Students used ABCya! Make a Robot to design their very own problem-solving robot! Would you like to meet one? 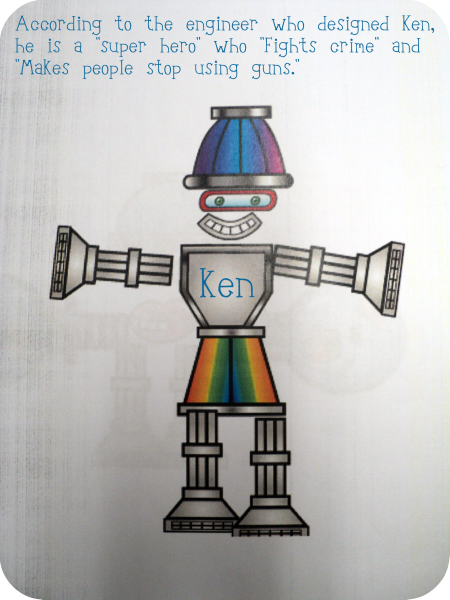 **If you are looking for a fun activity to do with your first or second grade class for National Robotics Week in April, you may enjoy this one. Materials Needed: EGFI “If I Were an Engineer Book”, a video that shows a problem, a place to record a brainstorm session, and computers with an Internet connection. On a 1-10 tech difficulty scale… I’d give this a 3 because you have to load a video to play and help students navigate to a website and print. (You could also save the images digitally and go-paper free. I printed due to time constraints caused by our unplanned fire-drill.) If you’d like a Lesson Plan copy, just let me know!